The ePipe® lining system is the choice for state, county and city decision makers faced with pinhole leaks, brown water, or encrusted pipes. The operational responsibilities and the fiscal budget limitations of a municipality demand a quick, inexpensive, and yet, reliable solution. Time and Money are the two reasons that Florida Pipe-Lining Solutions should be your choice for water line repairs. By using your pipes that are already in place, in walls, underground, and under slab we can quickly set up our equipment to begin the process. Because there is little to no destruction of walls and floors, there are no large reconstruction and “put back” costs once pipe restoration is complete. The ePIPE lining system provides an effective answer to supply line replacement for either lead or leakage problems. Lining the service supply lines from the water main to the faucet tap, the ePIPE process provides a more comprehensive and robust solution to tackling the dissolved lead issue within the drinking water supply. Sometimes a water supply system is encrusted and the pipes wrapped in asbestos. Repair or replacement have to be completed, but a shutdown of the facility is not feasible. Set up of the Epipe® lining system can begin on a Friday and the complete project can be completed over the course of the weekend with no interruption to the general operations associated with a pipe restoration process. A number of factors by themselves or in combination can affect the corrosion rate in a piping system. Depending on the degree of these various factors, signs of corrosion can show up in piping systems in as little as two years after being installed. Some of these problems may even show up when using water sources of the highest quality. Even diminutive pinhole leaks in your piping can cause major water damage and mold, to your walls, ceiling, and floors, leading to expensive remodeling. Experiencing lower flow than normal is an indication of problem in your piping system. While many people blame brown water on the source of their water, oftentimes the water coming into their home is clean and the problem is actually rust within their piping system that is contaminating their water. Corrosion in your piping can cause leaching of lead and copper into your drinking water. Air Hoses are connected at various points to the water system. Technicians then use pre-heated and filtered air to dry the isolated system. The cleaning of the dried piping is accomplished by using a mixture of air and sand to scour the inside of the piping. This cleans and prepares the internal pipe surface for optimum bonding of the patented and NSF-61 approved epoxy. The application of the epoxy lining is the final stage of the ePIPE® process. The patented lining provides a barrier coating to seal and protect the piping system from future corrosion. ePipe® protected lead pipes provide protection against lead from leaching into your drinking water. Starting in 2013, EU and UK standards for lead found in drinking water will follow World Health Guidelines of 10ug/l (10 PPB). Our lead pipe repair process and lead pipes protected with ePipe® linings will reduce lead to safe drinking water standards. 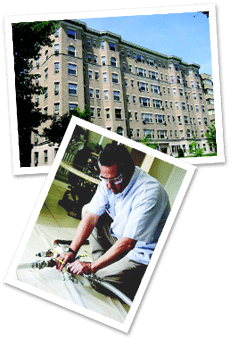 Read more about lead pipe remediation here. The patented process effectively seals pinhole leaks in place, saving water and damages resulting from leaking pipes. ePipe® is installed inside existing pipes, minimal disruption is required. Often, no digging is required to install ePipe®. 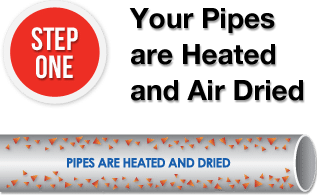 Pipes are restored right inside your walls, in-place, resulting in minimal damage or intrusion into your building structure. Corrosion build up inside a pipe can restrict water flow. 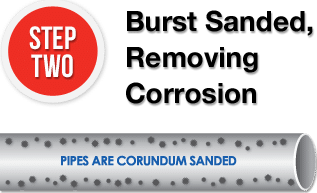 ePipe® protected pipes are cleaned of corrosion and then lined. The result is improved water flow and cleaner water. ePipe® can be installed in a matter of hours. 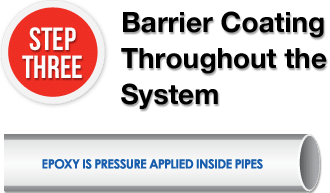 For over a decade ePipe® has been chosen by 1000’s of property owners in the US, Canada, Mexico and Europe to stop leaks and corrosion and to restore and repair pipes.